Don Alvin Montgomery passed away at home on Sunday, August 28, 2011. Don was born January 22, 1936, in Goodlett, TX to Cephas and Thelma (Guthrie) Montgomery. The family moved to Washington, where Don graduated from Renton High School in 1954. He served in the U.S. Marine Corps from 1953 to 1955, then in the U.S. Air Force from 1955 to 1961, and was a Veteran of the Korea War. He married Mable Doris Sikes in 1961, and raised two children, Steven and Michelle. He married Debra Larsen in 1984, and had two children, Chad and Dane. Don was the Radio Technician for the Washington State Department of Transportation until 1991, when he retired. 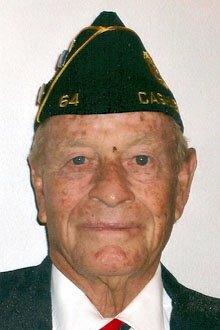 He was an active member and past Commander of the Cashmere V.F.W Post #64, played Golden Age softball, was a 4-H leader, and enjoyed hunting and fishing. Playing along with his children and grandchildren was also a favorite activity. Don always had a smile and a good story to share, and was willing to help out anyone in need. He was preceded in death by his parents; his brother, Henry; and sister, Vela. He is survived by his longtime partner, Marlene Peterson of Cashmere; son, Steven James (Penny) of Monroe, WA; daughter, Michelle Renee of Cashmere; sons, Chad Taylor (Margo) of Genesee, ID; son, Dane Thomas of Cleveland, OK; grandchildren, Laken, Arieca and Tarrah Te Velde, Emerald and Clifton Montgomery and Tyler, Kaedan and Logan Montgomery; brothers, Kenneth “Dale” and Cephas “Butch”; and sisters, Hazel “Lou” and DeLois. He is also survived by many cousins, nieces and nephews. Visitation will be held at the Cashmere Legion Hall, 401 Sunset Highway, on Monday, September 12, 2011, at 11:30 a.m. Service to follow at 1:00 p.m. with Graveside Military Honors. Lunch will be following at the Legion Hall. Memorial donations may be made in his name to the Cashmere V.F.W. Post #64 or to WSU Chelan County 4-H Equine Program. Jones & Jones~Betts Funeral Home is in care of the arrangements.